Gourmet Girl Cooks: Sunday Night Steak Dinner...and "Mini Caprese Salads"
Sunday Night Steak Dinner...and "Mini Caprese Salads"
It was a busy Sunday...we ran lots of errands today. Both boys came over for dinner this evening so I decided to grill steaks since it was such a beautiful day outside -- it was 59 degrees this morning! 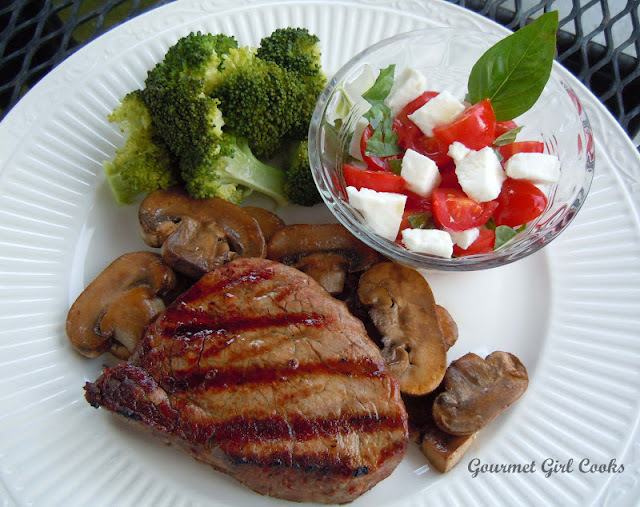 We had grilled filet mignon with sliced mushrooms, steamed fresh broccoli and mini Caprese salads. Hubby and the boys also had baked potatoes with their meals too. 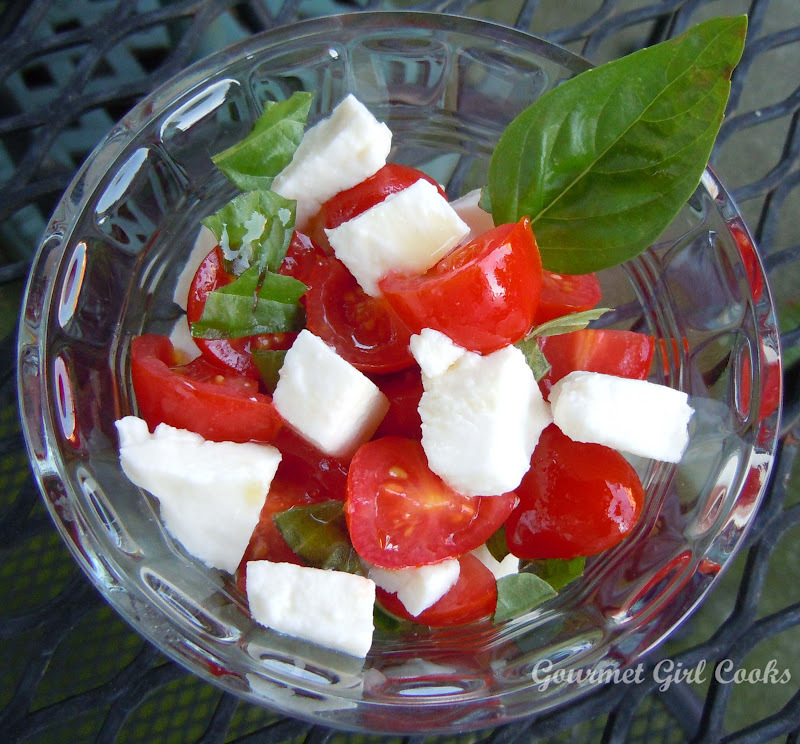 I decided rather than make the regular typical Caprese salad which is sliced tomatoes, sliced fresh mozzarella, fresh basil leaves drizzled with olive oil (usually layered overlapping on a plate)...that I'd make everyone their own mini versions. They turned out really good and I actually prefer serving and eating them that way. I simply quartered ripe cherry tomatoes, diced fresh mozzarella and tore fresh basil leaves into tiny little pieces and then drizzled them with extra virgin olive oil and some freshly cracked black pepper and served them in little individual custard cups . To give the salads a little more pizzazz, I marinated the tomatoes in some olive oil and Pomegranate vinegar for an hour or so before assembling the mini Caprese salads. 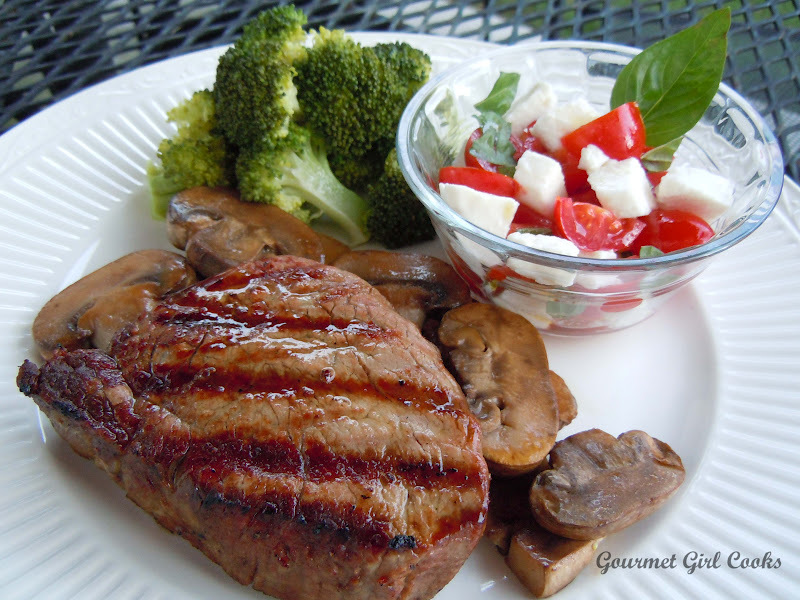 It was a simple, fresh and delicious dinner. I snapped a few pics below. Enjoy! Cute little mini Caprese salads.